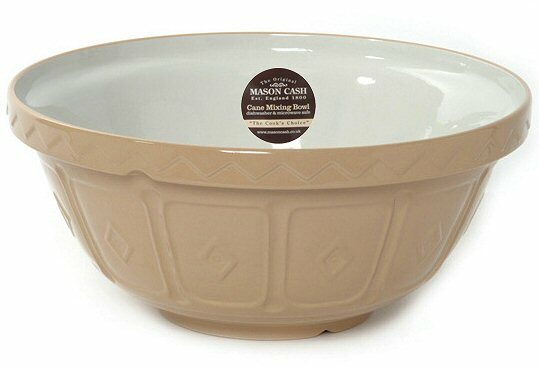 The traditional white and cane mixing bowl from Mason Cash has become a "classic" recognised all over the world. In these days of "disposables" Mason Cash is the only company making traditional Mixing Bowls from traditional materials in the traditional way. Unlike some inferior copies you may see around, these are the originals. As a result, these bowls are likely to become well used and loved family heirlooms which will still be going strong in 50 years time. The origins of Mason Cash go back to a pottery which was already operating on the current site at Church Gresley in Derbyshire around 1800. The pottery was run by a succession of Master Potters of whom the most colourful was "Bossy" Mason in the late 19th Century. When Tom Cash acquired the pottery in 1901 he changed the name to Mason Cash & Co - a name retained when the company was incorporated by his son in 1941. The business has remained family owned and run throughout its history, and Mason Cash continues to make traditional products, using traditional, local materials wherever possible. A century ago all kitchens would have had many Bowls & Basins for mixing and cooking. The Mason Cash Mixing Bowl is a design classic - the shape surviving unchanged for a century because it so perfectly meets the users needs. These days, no longer restricted to the kitchen, the Bowls are widely used for storage, serving and even, we are told, for cooking Lancashire Hot Pot! Being glazed earthenware the bowls are substantial - so they don't move about as you mix and may be gently warmed in the oven or microwave - to help blend in butter. When mixing is done the bowls are perfectly safe in the dishwasher. The large size is highly recommended, since you will have not only all the volume you need for a full "Christmas Cake Mix", but also a very attractive object in your kitchen. However, more units of the medium size are sold than any other size. The smaller size mixing bowl combines adequate functionality for most uses with a very affordable price. You may also consider buying all three sizes, as a set not only has a higher collectable value, the bowls can be stacked one inside another for easy storage - and you can save money by buying them at the same time!